Ideal location 1/2 mile West of the bridge with quick on/off island. Very close private beach access, only for neighborhood (not a public CAMA access; so no available parking for daily beach goers - makes for less crowds on our stretch of beach). Now furnishing all linens and towels. Bed arrangement: King, queen, 4 twins (2 sets of bunk beds). *Dog friendly - 1 only considered with non-refundable $125 fee in addition to rental amount and refundable security deposit. No other pets besides dogs considered.. Exterior recently fully repainted. New washer & dryer & new dishwasher in 2018. Other recent improvements include: new flooring, new half bath, new furniture. 50" ROKU TV in main living area with new Kenwood networked sound system & Klipsch tower speakers. Stream Netflix Pandora, Spotify and many more with fast Wifi. Master bdr has 43" flatscreen TV, the 2 additional bdrs also have wall hung flatscreen TVs. Both full bathrooms recently remodeled, in addition to decks refurbished. King bed in master bdr. with 50" flatscreen TV, "Kid's room" has 2 bunk bed sets (4 total twin beds), Xbox One and Wii game consoles with a 40" Roku TV. Bdr #3 has a queen bed. Each bdr has darkening draperies and flatscreen cable TV's. * One of the best rated, least crowded and most beautiful family beaches found anywhere. *Wonderful water views of both Atlantic (front) and Intracoastal Waterway (back). * Plenty of great dining choices, shopping and children’s amusements, all within a 2 mile radius. * Approximately 40 world class golf courses within a 30 minute radius. Holden Beach still offers a great alternative to the crowds and commercialism of nearby N. Myrtle Beach, which is only approximately 35 miles away or Wilmington beaches which are typically much more crowded. Owner is a licensed real estate broker in NC, however this is our personal property and 2nd home. Rob & Cheri Hall. We live in Chapel Hill, NC. As of Summer 2019 we've been married 20 years with 2 great kids. Olivia is 16 and Justin is 14. Hence 'JustLiv'... We bought the property in 2002 and each year try to improve and modernize it both for our guest and for ourselves. We have privacy with no one behind us, yet are only about a 1 minute walk from the beach. We feel it is much better than 2nd row because of not being surrounded by houses and not sitting on a busy main thoroughfare. Brunswick Ave is ideal for biking, blading or walking/running because it is quiet and safe, yet just a block from the beach and parallel to the beach road (Ocean Blvd). From the front we have a ocean view and from the back we have a view of the Intracoastal waterway. Our landscaping in the backyard includes 3 large palm trees giving a nice private tropical feel. We have multiple decks on both sides and a great patio area down below ideal for grilling with a nice breeze at street level (hang the hammock down there for a great nap!). There is a wonderful outdoor hot/cold shower that is very refreshing after a day at the beach. We absolutely had blast and the house was perfect! Super short walk to the beach. Short walk to beach! House has everything you need and is kept up very well. We loved Holden and this house!! Beautiful Home, Beautiful Island, Short Walk to Beach, Short Drive to Everything! We totally enjoyed our time at Holden Beach. The house was beautiful. It had plenty of space for all of us and My grandsons said that the best part of our stay was that the beach was so close to the house. We walked to the beach almost every day and either flew kites, played in the sand , or played in the waves. The waves were very strong so we didn't swim much, the weather was also not very cooperative, but it was fun all the same. The beds were comfortable and The grandsons were glad to have the Roku to watch their special TV programs in the evening and they were very happy to have all the beach toys available, especially the boogie boards since we had to eliminate items from the car for space. My husband loved the balconies on the house. We had wonderful views from every porch! My daughter and son-in-law were very pleased with the kitchen and cooked several meals with the cookware provided. The large table was great. We all fit well although we could have done without the hammock being stored by the dining table. I loved that the island was protective of turtles and watching the many varities of sea birds made my my heart sing! 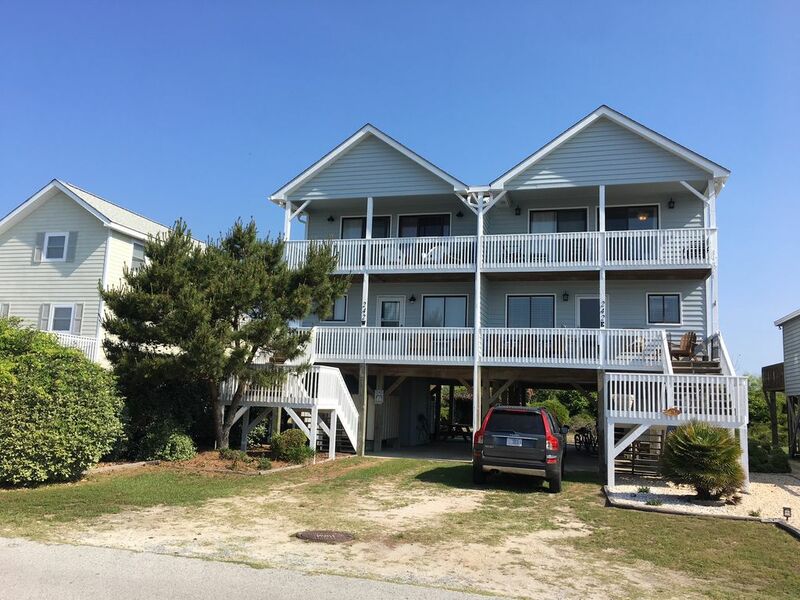 The property is beautiful and I would recommend it to any family looking for a special week at the beach! We had a fantastic time at Holden Beach and the house was perfect! The second floor deck off the kids room and queen bedroom was a favorite hangout spot. The view of the ocean from the deck was awesome and traffic was so light that you could hear the waves crashing. The location was great and it was just a quick walk to the beach. The house had everything we needed. We had four adults and our two teenage daughters and everyone had a great time. The only downside was that we were only there one week. We were sad to leave and can’t wait to come back again. We enjoyed our week at the beach! Even though this is fourth row, the walk is very easy. Only down fall of the house is the washing machine is very loud - we learned to wash our clothes when we were gone or went to bed. We enjoyed our stay in this house. It’s a 3rd row house, short walk to the beach. Beach activities are the main attraction. 9 miles of the most unspoiled, non-commercialized wide beaches in the U.S. Low-key, family oriented island community that is very safe, especially for those with small children. Plenty of excellent dining choices and shopping within a 2 mile radius, many more within a 30 min. drive to either N. Myrtle Beach or Wilmington. Plenty of activities for the kids including water slide, bumper boats, go carts and miniature golf within 2 miles (on mainland across bridge). Over 40 of the best golf courses in the greater Myrtle Beach area are between a 5 to 30 minute drive. Our street is quiet and safe (parallel to main Ocean Blvd), perfect for biking, running or blading. Prime Summer weekly stays only (7 nights), price includes everything (no hidden fees). When nightly rates are offered, add $75 cleaning to the total. All linens now included. *Dog friendly:1 dog only considered (no more than 1) with $125 non-refundable fee and signed addendum. NO OTHER PETS besides a dog will be considered.